National PTSD Awareness Day is celebrated annually on June 27. It aims to raise awareness of posttraumatic stress disorder, a mental health problem that may develop after a person has been exposed to one or more traumatic events. Traumatic events that may cause PTSD include physical or sexual assault, war-related combat stress, terrorism, natural or man-made disasters, and other threats on a person's life. Typical symptoms of PTSD include distressing dreams, persistent thoughts and recurring flashbacks about the traumatic event or events, numbing or avoidance of memories of the trauma, triggered emotional responses, persistent hyperarousal. 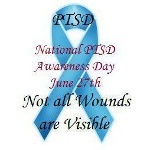 The first National PTSD Awareness Day was held on June 27, 2010. This observance was officially established by the Congress. In addition, the National Center for PTSD has designated June as PTSD Awareness Month. National PTSD Awareness Day aims to raise public awareness about the disorder, educate a wide audience about PTSD and provide people affected by PTSD with access to proper treatment. How to help raise PTSD awareness? You can start with learning key information about PTSD, its causes and treatment options. Then share your knowledge with others, promote PTSD awareness via social networks and reach out to help those who need it.